It has been a stressful couple of days for several rural families here, including mine! 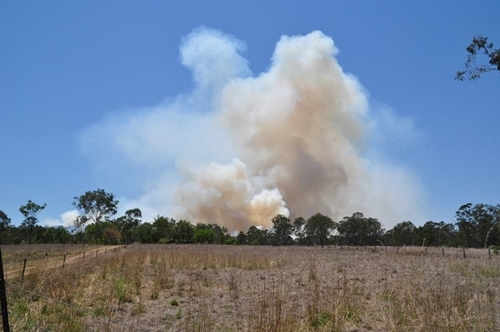 One of the most terrifying things that property owners have to deal with is a raging bushfire, helped along by strong winds on a hot day. I was at work on Friday and I knew there was a fire very close to where several friends lived, and when The Hubbster rang to say it was quite close to our property as well, I felt a little uneasy. I collected the kids from school and drove home through thick smoke, only to see two police cars monitoring the area, making sure the fire didn't jump the road. We would have been in big trouble had that happened. One police car continued doing laps up and down the road, past our turnoff, and every now and then we would hear a fire siren. My friends had spent most of the day putting in more fire breaks with their dozer, and ensuring they were as prepared as they could be. In the late afternoon, the wind changed direction......we could literally feel it, and the fire turned and raged back up the hill, away from us and back towards my friends properties...again. The wind was really strong and we were okay, but worried for our friends of course. I texted my friend to let her know that The Hubbster was home and was on standby if they needed any more help. Fortunately they were well taken care of by our Rural Fire Brigade and the bushfire was brought under control and thankfully no damage or lives were lost. It sounds dramatic, I know, but when one lives in the country, and there is so much land around you, the sight and the smell of a fire, is just the most dreadful thing. I'm glad that both you and your friend's property is OK. We live with the fear of fire, too. We have had a few wet years so bushfires have been few, but this year is much drier so we will have to see, what this year brings. 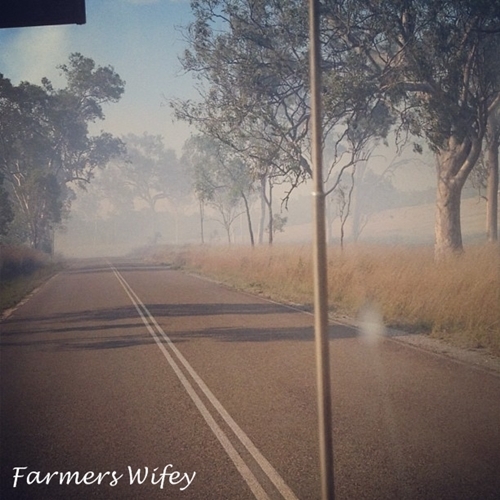 The neighbours had a burnoff go out of control a few months ago, thankfully our grass was short and the firies got it under control before it spread! So very very frightening. I am glad you are all OK.
My father always used to say "fire is a good worker but a harsh master" - glad you are safe. I am so glad the fire was brought under control...Mother nature seems to be upset this year and every year lately. Please take care! I heard and saw the fire on the TV news that day. I'm glad you're all okay, scary having a fire so big get so close to your home. To me there is nothing more terrifying than fire. Prior to my birth my folks lost their farmhouse to fire. 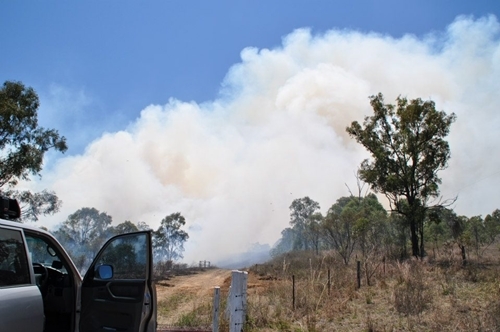 We are told here that because of the dry winter there has not been sufficient prescribed burns done by the authorities so we can only hope that there will be no more devastating bushfires such as last year. It does sound dramatic... but it WAS! We're in a fairly cleared area, but its still a worry when you smell smoke or see that telltale glow in the evening. Glad you and your friends were OK. Sorry I didn't mean to worry you when I spoke of my folks losing their home to fire. 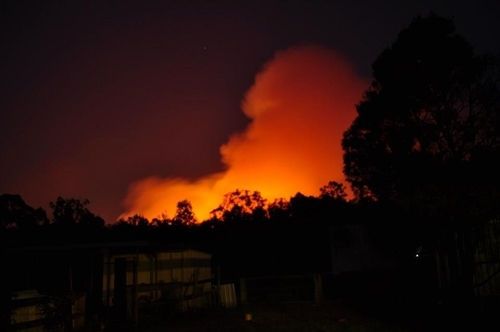 It was not as the result of a bushfire but an accident in the house caused by their son when they were away. A very worrying time. Glad you came out okay. 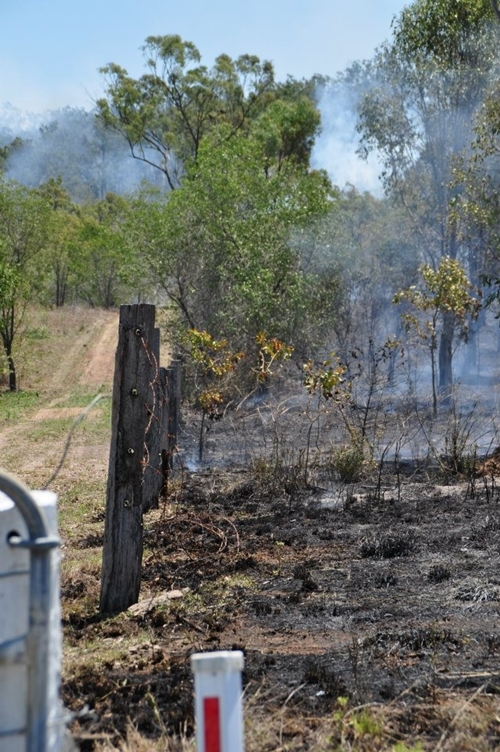 Hopefully what has been burnt and cleared will minimise the danger you will be in for the rest of summer. Thank God for the RBFB.